I’ve just entered my second Summer as a Triumph Bobber owner. It’s been a great year and I’ve really enjoyed being back in the saddle. What follows is how I came to choose the Bonneville Bobber, how I’ve made it my own and how I’ve found it over the last 12 months or so. If you are considering buying a Triumph Bobber you will hopefully find some of this useful in making your decision. 0.1.1 The Itch That Wouldn’t Scratch. 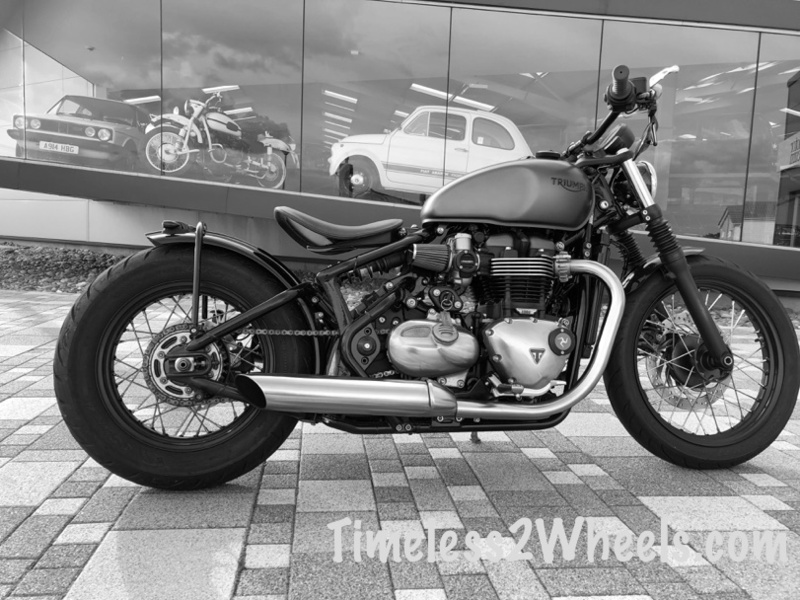 1.6 Is The Triumph Bobber For You? I started my motorcycling on field bikes at around 13 years old. At 17 in the early 1980’s I was tear arsing around on a Kawasaki KH250. Once I had passed my test the natural progression was to move up to the Kawasaki Z650. My Dad convinced me to go and take a look at his mates old Triumph Speed Twin which was for sale. Looking back now I realise my Old Man was just trying to steer me away from the Z650. I had a reputation for being a ‘bit of a lunatic’ on the triple and he probably thought I wouldn’t last long if I went on to buy something that made it look like a moped. He was probably right. Like most 17 year olds, I was no where near as good a rider as I thought I was. Tales of the Ton Up Boys and stories of the Mod v Rocker beach battles were told on the trip to see the Speed Twin. All I realise now, in an attempt to plant an emotional bond with the British Marque before I’d even sat on one of it’s motorcycles. Our visit to see the Speed Twin didn’t start well as we couldn’t get it going. After lots of pushing, bumping and fiddling the seller took a set of his wife’s tights off the washing line and put them over the air intakes and it eventually burst into life. It had the obligatory Triumph oil leak and was carrying a fair bit of rust but it had a set of mini ape bars on and it sounded amazing. It looked like something The Fonz would ride. In that one afternoon my entire outlook on motorcycling changed. It was no longer about getting from A to B as fast as possible, it was about the ride. The Itch That Wouldn’t Scratch. I had customised a couple of my old Triumph’s back in the day and every now and again over the last ten years or so had considered dipping my toe again. Then the memories would flood back about sourcing parts and the weekends spent in the shed fault finding instead of riding and I’d dismiss the thought. I probably didn’t have the patience to go through all that again and I certainly didn’t have the time. And then a few years ago I started noticing the retro style motorcycles coming off the production line. Despite not having owned a motorcycle in the current century some of these new machines were definitely turning my head. The urge to treat myself was growing and the itch just wouldn’t go away. I was doing a lot of research, test riding and talking to riders. It soon became clear that there were plenty of other past riders being tempted back into the saddle. The marketers of these Retro’s would have you believe their bikes are purchased by 20 something year old Hipsters. 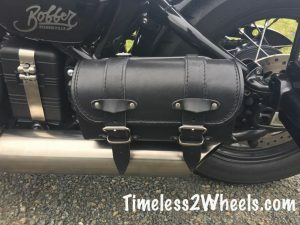 It’s my experience the majority are either born again bikers like me or older sports bike riders who are looking for a more comfortable riding position. I came very close to purchasing a Ducati Scrambler. I’d had an old Yamaha XT500 as a kid and the Scramblers looks were pulling at my nostalgic heart strings. The cheque book was in my pocket when I visited the dealer. The bubble was soon burst though when I mentioned green lanes and he was looking at me like a vampire does when you show them a crucifix. I wasn’t going to purchase something called “The Scrambler” when it couldn’t scramble. Once home I got myself a ticket and a few weeks later headed off to the 2016 Birmingham Bike Show. “Are you ok down there Fella?” One of the guys on the Triumph stand at the Motorcycle show asks me as I’m squatted down by the side of the Triumph Bobber. “Yes mate, I’ll be getting up once this hard on subsides” I promised. Once home I got the red Bobber ordered from my local Triumph dealer. I placed the order based purely on it’s looks and the sit on I had at the show – no test ride as they weren’t in the dealerships yet. When it eventually arrived it came with an Ironstone version and my dealer was good enough to let me change the red one for it. The Bobber is the closest to being my ideal looking motorcycle straight off the production line. That said, there were a few things I wanted to change straight away. I ordered the shortened mudguards (fenders) and side number plate when I placed the order for the bike. These were installed by the dealer. 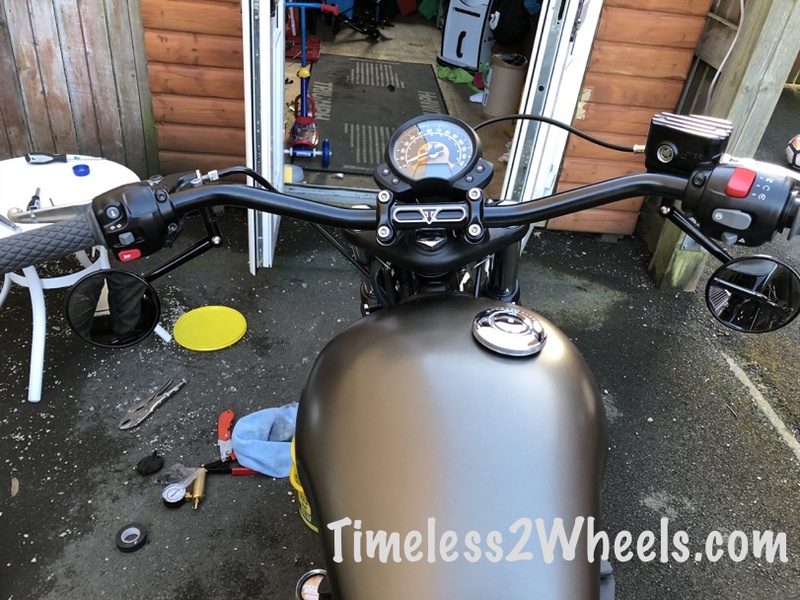 Having the official rear Triumph short mudguard fitted meant the back light fitting and indicators had to be replaced with a set of multifunction lights. The trouble was that the Triumph multifunction lights were for the American market and flashed red – illegal in the UK. It turned out to be a blessing in disguise as they are way too big for the clean Bobber look anyway. I replaced them with a set of much smaller Rizoma S club multifunction lights and they are much more discrete. You don’t notice them until they are on. AR Harley in Blackpool were very helpful and offered plenty of advice regards the choice of lights open to me. There is no place for you to store so much as your mobile phone on the Bobber. No under seat storage, nothing. 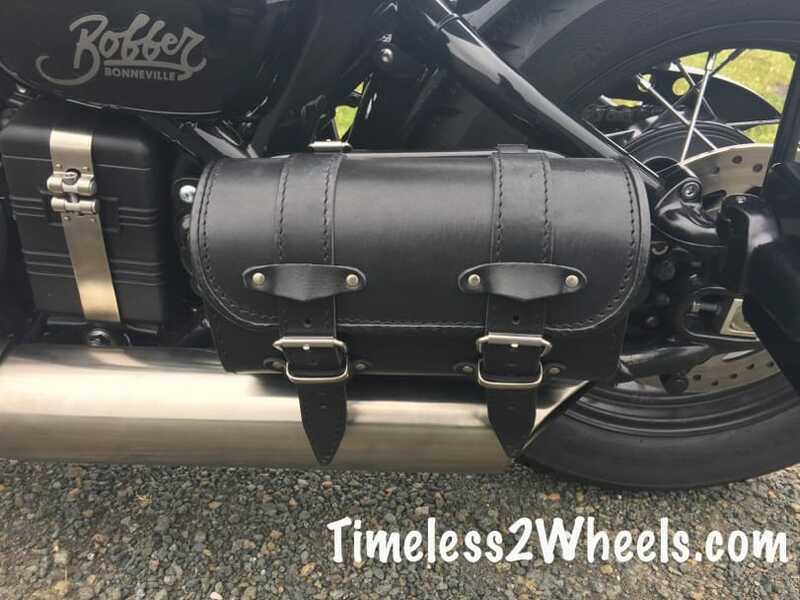 Came across the Bike Brothers in Germany when searching for a tool bag for the Bobber and ordered the one in the photo from them. I had noticed it on a custom Triumph Bobber they had done. After messaging them via their Facebook page I was told they were planning to produce a few for sale. They shipped one to me a couple of weeks later. It’s top quality and small enough to be unobtrusive but just big enough to carry your sunglasses, goggles, keys, phone, a rag and a few tools. The last 2 aren’t required but it’s a Triumph and old habits die hard. I’ve since become a regular visitor to the Bike Bros online store and they tempted my wallet open again when they released a set of beach bars with pre drilled holes allowing for the cables to be hidden inside. While at it I also ordered their hidden front indicators to clean up the front forks. Also a set of Montana mirrors to finish off the low flat look I was after. The handlebars were powder coated black locally before I installed them. If you plan to go this route the clutch side is possible without cutting wires but the throttle side was a nightmare. I ended up cutting all the wires and using an electricians fish hook to pull them through the bars. The finished look is great though and all that’s left on show is the brake pipe and clutch cable. Well worth the effort. One of the few things I really disliked about the Triumph Bobber was it’s name. For a start, off the production line and without the optional short fenders it looked more like a Roadster or Hot Rod than a Bobber. Bonneville Bobber would have been ok as it infers it’s a Bobbed version of the Bonneville, I’d be fine with that. Other names I could live with would have been The Bonneville Roadster or just plane old T120B. To call it “The Bobber” though is a bit pretentious in my book. Rant over – the side panels with the name on had to go. 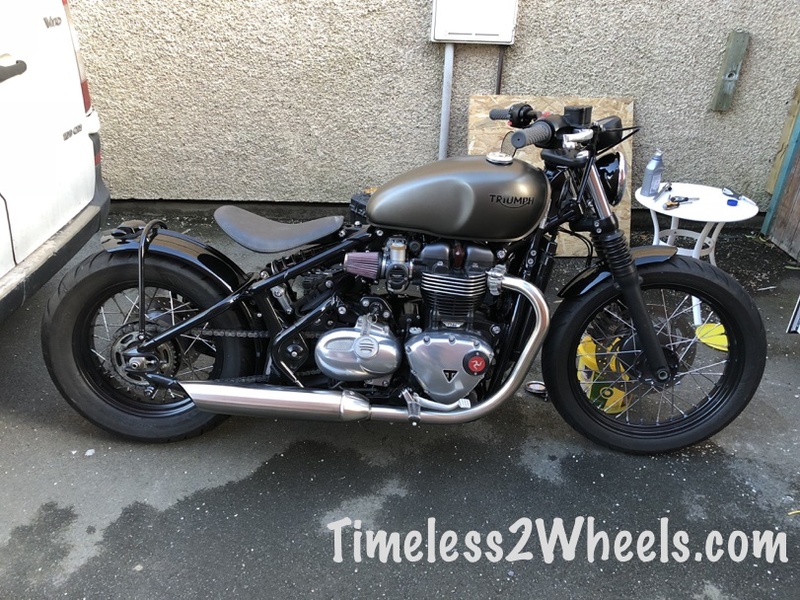 I was going to get them vinyl wrapped until I saw that someone on the Triumph Bobber Forum had done away with the side panels and I really liked the look. The airbox has been replaced with the K&N air filters and the wiring and fuse box is tucked under the grey 3D printed cover you can see directly below the shock. I purchased this from Viba, a French custom builder. I haven’t noticed any difference to the running of the bike since removing the airbox. That’s the Statement seat from Triumph which I think adds to the low look I was after. The Statement seat is fine for bar hopping but I wouldn’t want to do anything more than a day trip on it. The other bits I’ve changed are what you can probably see in the photo above. There are now several aftermarket exhausts available for the Triumph Bobber. I’ve as yet seen nothing that made me want to rip off the stock exhaust and hand over around a grand. I love the stock exhaust noise and looks so until they actually need replacing I will be sticking with them. I would prefer them in black though. I did put on a Free Spirits X-pipe which I got from A R Harley. The X pipe seemed to make a slight difference to the tone of the exhaust note. Apart from the weight you lose though, I don’t think it’s worth doing. Special mention goes to the Booster plug which I would have to say was the best $160 I’ve spent. I struggled to control the Bobber at low revs when in slow moving traffic. The throttle would feel snatchy. Never having a fuel injected motorcycle before I put it down to that or the ride by wire system. It was a German guy on a BMW that put me onto the Booster plug. As I understand it, modern engines have to run lean to pass emission tests and it’s this that causes the low rev problems. 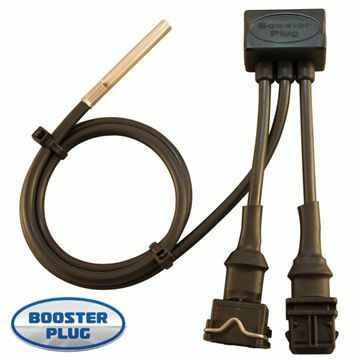 The booster plug simply tricks the engine into thinking the air temperature is cooler than it really is. The ECU will then richen up the fuel mixture to compensate for the cooler air. It took 5 minutes to fit and the difference is dramatic. More info here. The practicalities (or impracticalities) of being a Bobber owner. The Triumph Bobber pulls like a train – it’s got more torque than the Yamaha MT10 (R1 engine) and from a standing start can live with one – at least for the first few gears. It also handles far better than you would imagine and is great on twisting country lanes. All this means that as well as those amazing looks, it’s bags of fun too. However, the Triumph Bobber is not going to be the most practical motorcycle you have ever owned. It’s not designed to be. The Triumph Bobber tank only holds 9.1 litres. If you want to go touring the roads of Europe you need something like a BMW R1200GS. 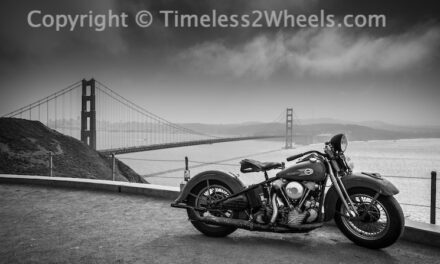 If you are on the other side of the pond and planning to do the route 66 trip you should probably get yourself a big Harley. 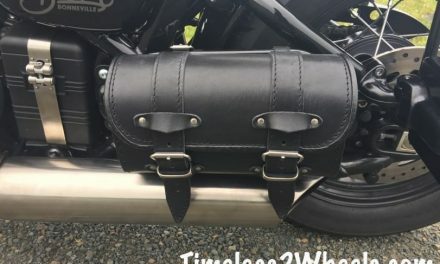 The Triumph Panniers are nice (expensive) but ruin the look in my opinion. Even if you have them fitted, it’s a weekend away at most – with no rear seat there’s nowhere to strap your camping gear. The Bobber comfortably cruises at 70mph but because of the riding position this gets tiring very quickly. I doubt I would want to go on a long motorway trip even if it could carry the luggage. I got caught in a heavy shower last Autumn. I stopped under a tree to wait for it to blow over. Once it stopped I continued on and within a few minutes my arse was soaking. I pulled up to find out what was happening and when I got off there was a pool of water on the seat. The back tyre was throwing the water from the road up my back. It then ran down my leather jacket and onto the seat. Because of the shape of the seat it just pooled and soaked through my jeans. A Barbour style trial jacket that overhangs the seat would probably cure it. For now though, I try and avoid rain. Note that I have the short mudguards. I don’t know if this would be a problem with the larger stock rear mudguard. In its stock format the Bobber would make a good commute bike if you are looking for something to get you to work every day. There are probably cheaper and more practical options though. You would at least be turning up at work with a big grin on your face. Is probably like me and uses it purely for recreation. Perhaps they have another more practical ride in the shed and The Bobber is reserved for lazy Sunday rides. For me The Bobber is what I throw my leg over on an afternoon to forget the hassles of work. A year on and I still find myself grinning as I wheel her out of the shed. Pull out of the village, turn onto the IOM TT course, wind open the throttle and the problems of the day are left behind with the rest of the traffic. Apart from a blow out on the Greeba Castle bend which required a new rear tyre, I’ve had no problems at all. With 4k miles on the clock The Bobber still looks like new. I do avoid the rain though and if I do get caught I I like to clean the bike thoroughly. I’ve found the headers polish up like new if you buff them up every 2 weeks with some Autosol cream. A long rag wrapped once around the exhaust header and then holding each end of the rag, vigorously work the rag back and forth. 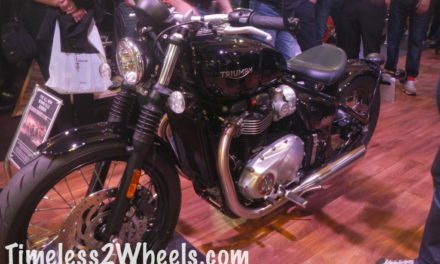 Is The Triumph Bobber For You? “The Thruxton is all about performance and cornering and looking like a supermodel. The Bonny is your girlfriend. I love that quote. I first read it while waiting for mine to be shipped and thought it was the funniest couple of lines I had read so far about The Bobber. Then mine arrived and I realised Bobby had absolutely nailed it. 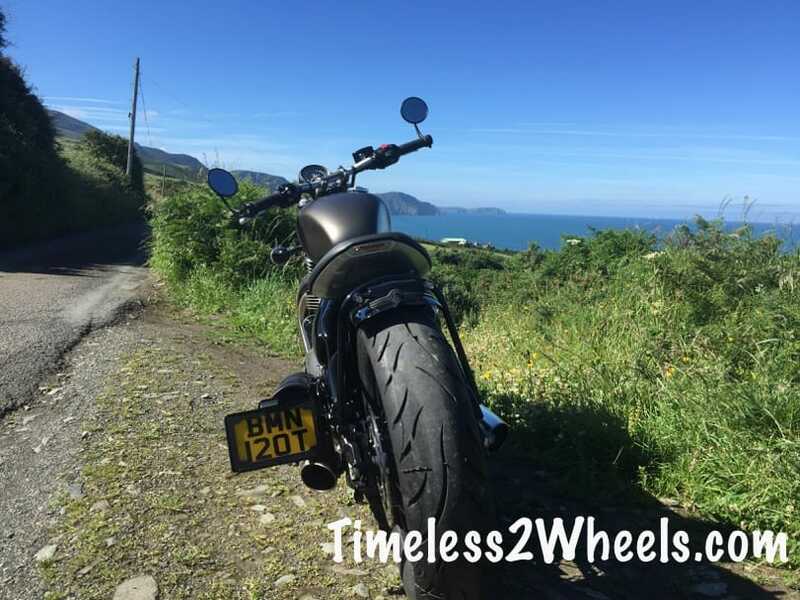 Have you been on the owners forum asking how fast the Bobber goes or if there’s a fairing available? 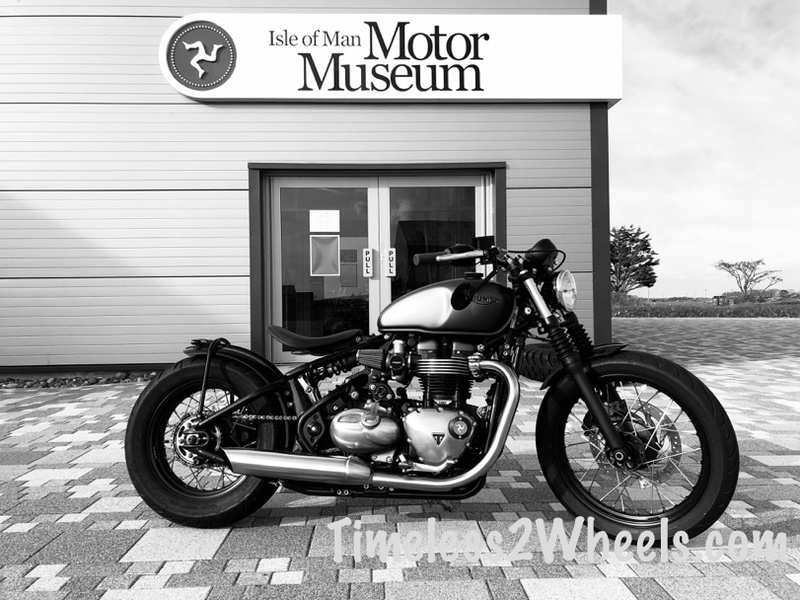 – Have a look at the Triumph Thruxton R.
Are you concerned about it only having a solo seat or a short range? – Play it safe and get yourself the original retro motorcycle, The Bonneville. If however, the Bobbers pre war looks do it for you – really do it for you – and if you get that the styling requires you make compromises then yes the Bobber may well be for you. Get yourself a test ride booked. Really nice write up, and very helpful. Just curious — how do you like those Bike Brothers bars after living with them for a while? ARe you still happy with them? Do you feel much difference in pullback and/or sitting position? Thanks! I’m very new to the bike world, my mate has been a rider for years and I have fallen in love with it every since a ride with him. He owns a few bikes including the triumph Bobber, after a few lessons and practices I have decided to get my own bike. However sadly I had to move to a new country without my mate’s help anymore. Would u recommend the Bobber as my first bike? 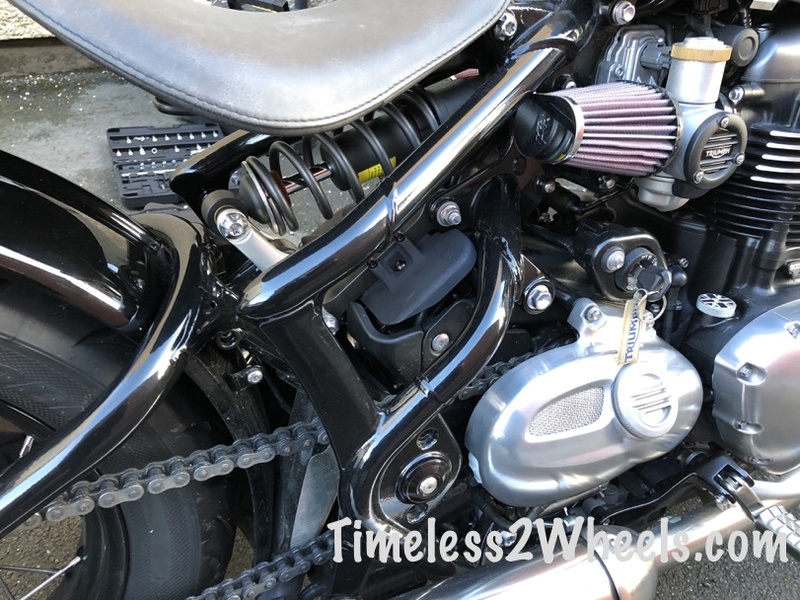 While the Bobber is a little on the powerful side for a complete novice to mount, the low seat height and rain mode would make it a possible first bike to own given that you have already done some riding. Are there any riding schools in your new country where you could continue to gain some experience?